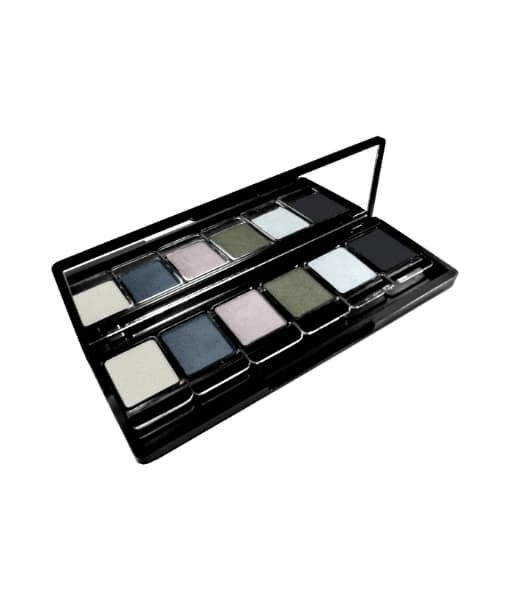 The 12 am Eye shadow palette is a divine range of colors chosen with style. Perfect for the ideal smokey eye. The minerals are finely milled and blended to create the most smooth and velvety texture. These soft neutral tones enhance daily looks with a beautiful glow. Dark blacks and midnight colors are perfect for the going out look. Talc free, this formula is perfect for any skin types including sensitive skin. The 12 am Eye shadow palette is a divine range of colors chosen with style. Perfect for the ideal smokey eye. The minerals are finely milled and blended to create the most smooth and velvety texture. These soft neutral tones enhance daily looks with a beautiful glow. Dark blacks and midnight colors are perfect for the going out look. Talc free, this formula is perfect for any skin types including sensitive skin. 6 x 2 gr pans. Mica, Zinc Stearate, Boron Nitride, Caprylic Capric Triglycerides, Allantoin. May Contain (+/-): Iron Oxides, Titanium Dioxide. ( *= Certified Organic) Mica, Zinc Stearate, Boron Nitride, Caprylic Capric Triglycerides, Allantoin. May Contain (+/-): Iron Oxides, Titanium Dioxide. Wow! Boy do I ever love this baby…Great color choices and great value. Long lasting and natural. Did some awesome looks for my runway looks. LOVE!! !